I'm having a pom pom/boho moment, which is odd for me. I usually prefer clothes and jewelry with clean lines. But, apparently there is another part of me that loves the freedom that bohemian garments and accessories evoke. I'm drawn toward the ease and anything goes attitude. Recently I fell in love with a puka shell and pom pom necklace from online retailer, Figue, only to find it completely sold out and so I have been searching for a replacement. Loving the magpie look of rhinestones and pom poms as well as other items mixed together, here are a few favorites in my search so far. 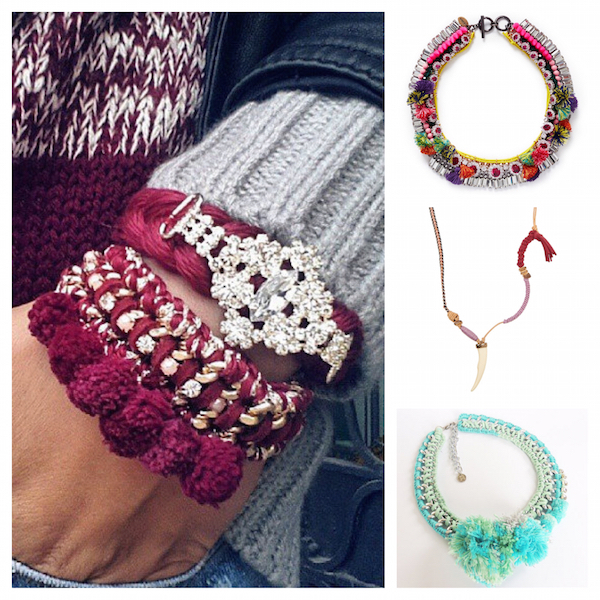 Left and bottom right: pom pom stack bracelets and crochet choker necklace. Top right: Diana jewel pom pom necklace by Venna at Lane Crawford. Middle: Etro at Net-a-Porter (now sold out in the time it took me to write this blog).